Pho. Soup of my dreams. Un-pho-gettable, that’s what you are. There is nothing better than a giant bowl of aromatic broth swimming with see-through noodles, topped with fresh herbs, crunchy bean sprouts and a shower of hoisin and sriracha. It is pho real. In Vietnam, pho is eaten for breakfast. It’s a brilliant way to start the day. It’s also a magical cure-all for colds, hangovers and general gloom. I’ve been slurping bowls of pho for a long time. 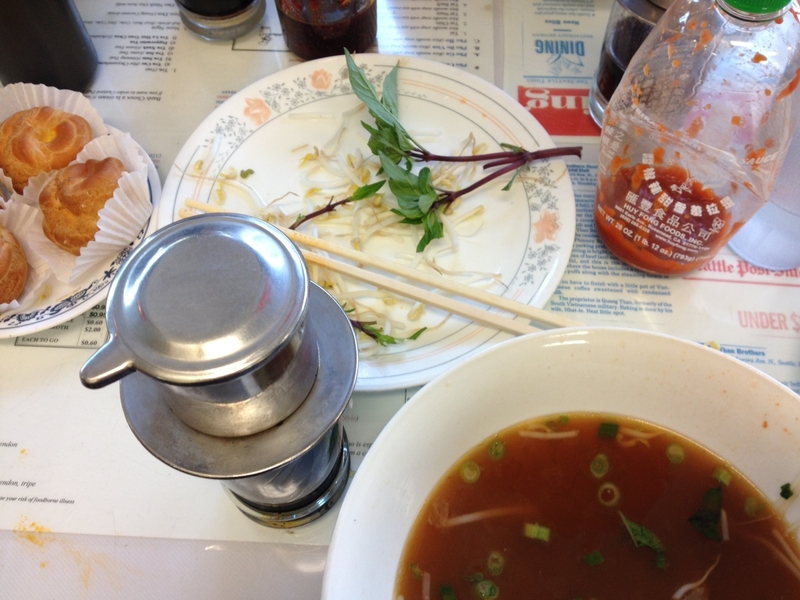 I had my first pho experience when I was growing up in Seattle. I would go to Than Brothers on Broadway and order the Pho Ga (chicken noodle soup). They’d bring a cream puff before the steaming, hot soup arrived (the French colonizers rear their haute heads.) I loved everything about it. Except the MSG hangover. Turns out there is much Seattle love for the big, brothy bowl! Makes sense, given that almost 300 days of the year make for perfect pho days…cloudy, cold and drizzly. Macklemore claims it fuels the Seattle hip-hop scene. His friend even made an homage to Seattle pho music video. I take special pride in this because Macklemore went to my high school. Or, maybe I should say it the other way around. I went to his high school. I wish I could claim that we were poppin’ tags at the thrift shop together, but that would be a lie. When Pom told me she’d made a batch of good, homemade pho, I was skeptical. I mean, doesn’t the broth take days and days to reach its peak? Doesn’t it require 30-something ingredients, making it the Asian equivalent of Mexican mole? Doesn’t it need to be gently coaxed and coddled by a tiny Vietnamese grandmother? The answer, my friends, is no. 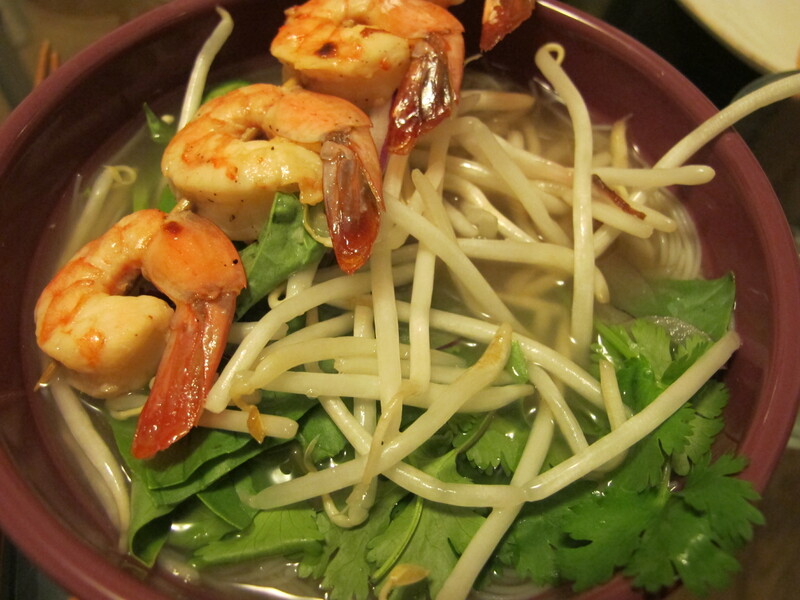 You can make this pho at home. Sans MSG and with a whole lot of love. It probably won’t taste exactly like the soup you get from your favorite pho joint, but I promise it will taste really good. And it’s easy. For my first batch, I decided to try using shrimp instead of beef or chicken. I marinated them, then roasted the skewers in the oven. Of course, you can use shredded chicken, thinly sliced rare beef or seared tofu for your protein punch. All would work well. This soup is very pho-giving, trust me. Heat a cast-iron skillet or frying pan over medium heat. 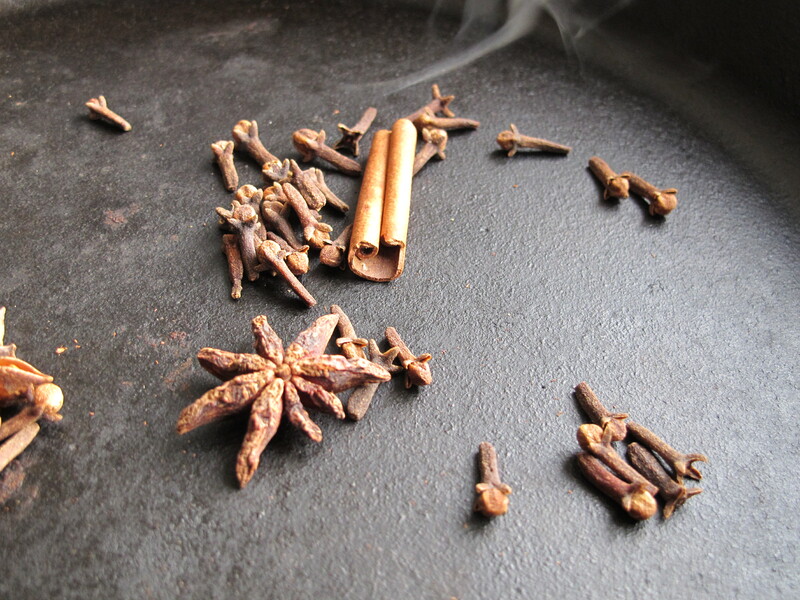 Add the coriander seeds, cloves, star anise, and cinnamon sticks and toast until fragrant, about 3-4 minutes. Immediately spoon out the spices into a bowl to avoid burning them and set aside. Whisk together marinade ingredients in a medium bowl, pour into gallon-sized Ziploc bag, add shrimp skewers, seal and let sit for at least 30 minutes. 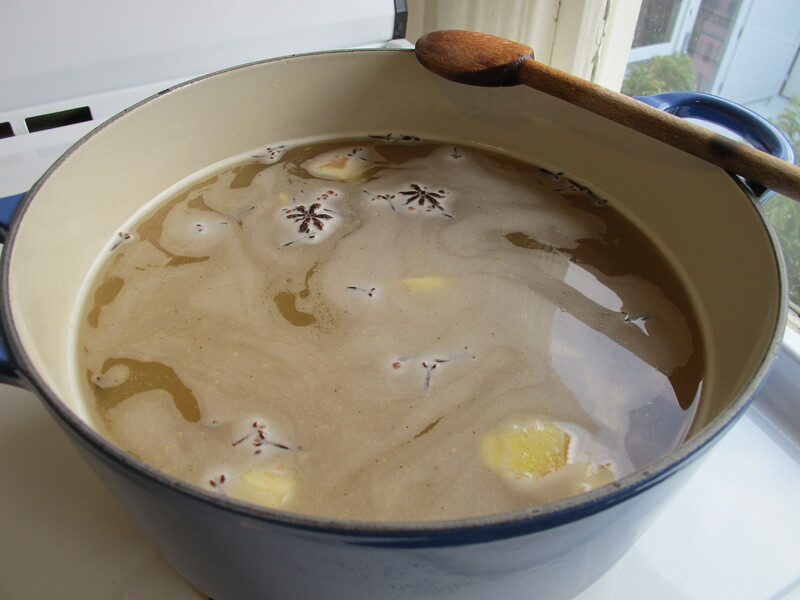 In a large pot, add the toasted spices and all Pho Broth ingredients except the rice noodles and bring to a boil. Reduce the heat to medium-low and let simmer for at least 45 minutes. While broth is keeping warm, heat oven to 400 degrees. Roast shrimp on a cookie sheet lined with parchment until pink and firm, about 6-8 minutes, rotating skewers once halfway through. Add the rice noodles to the broth and stir. Allow to sit for a few minutes while the noodles soften. Ladle the broth into bowls. Divide the noodles evenly into each bowl and top with a shrimp skewer. 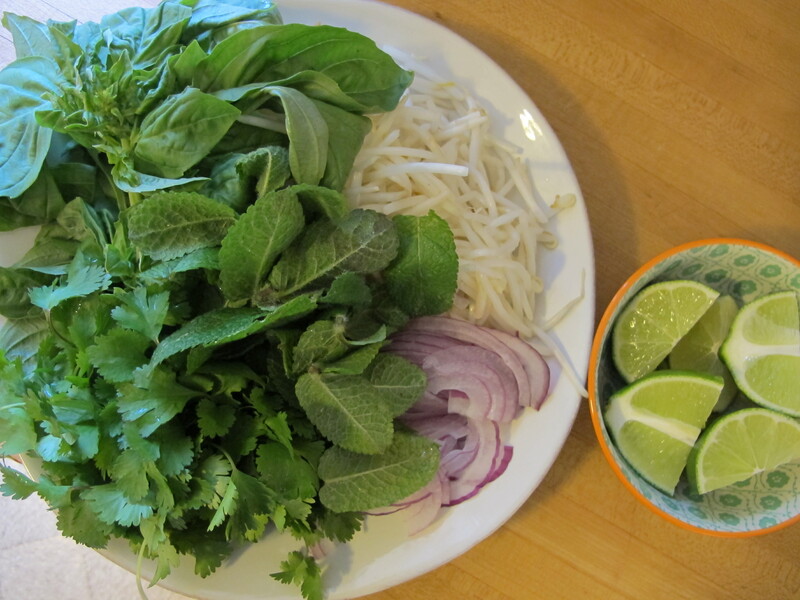 Place the herbs, bean sprouts and lime garnishes on a large plate. Customize your bowl of pho with toppings and sauces. Squeeze lime juice over the top. Conquer with chopsticks and a soup spoon. Thank you for giving us this! We all need pho. Ever. Hi: I love your blog! I live in Bozeman but I’m going to be staying in Ballard, Seattle next week. Could you recommend any restaurants in the area where I could get a bowl of pho? Hi Brooke! So happy you’re a Happelsauce reader! Seattle is full of great pho spots. Than Brothers is classic and there’s a location in Ballard. Here’s the link: http://www.yelp.com/biz/pho-than-brothers-seattle. Enjoy Seattle, the pho and the Than Brothers cream puff. Got a great tip from my local butcher about the thin sliced beef for the homemade Pho Tai. He said give them a call 24 hrs in advance and they will flash freeze then thin slice the beef so it cooks with just the aid of some piping hot broth. Apparently it has to be flash frozen or the beef just tears or won’t be thin enough. I go with the grass-fed sirloin and make chili oil by soaking some hot chili flakes in a mixture of organic sesame and veggie oil. 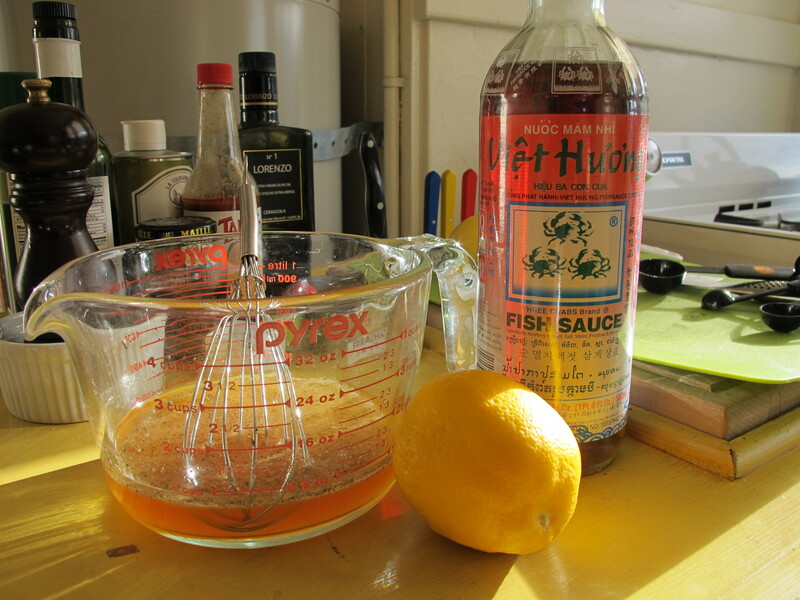 Still in search of a “clean” hoisin – any ideas? Wow! Love this tip. Thanks, Brenden. Not sure about “clean” hoisin. Good pho doesn’t need it at all, in my opinion. Just lots of herbs, lime and sriracha! « I Left My Heart In…D.F.